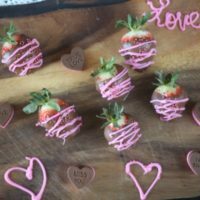 Making chocolate covered strawberries are simple and easy and great for the newbie cook who wants to impress their significant other. One of the most easiest desserts on the planet are Chocolate Covered Strawberries for Valentine’s Day. We love making these because of how simple they are — and you can make them taste different using the different flavors of chocolate as well. We have been making these for years since the kids were little. It was always something that they could make on their own without my help. The trick to making them delicious is making sure your melting chocolate is melted perfectly and not burnt (yes I have burned it in the past). Kayla loves making these with milk chocolate, but I prefer dark chocolate. But really — semi-sweet chocolate is the best for this. Refrigerate uncovered about 30 minutes or until chocolate is firm, or until ready to serve. 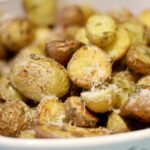 Melt Wilton chips in a microwaveable bowl in 10 second increments. Once melted, place in a pastry bag and snip a tiny tip off the top. Drizzle onto strawberries. Store covered in refrigerator so chocolate does not soften (if made with oil, chocolate will soften more quickly at room temperature). 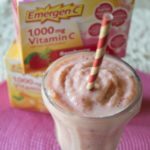 This recipe is perfect for those days you want a sweet treat that doesn’t involve cooking at all. 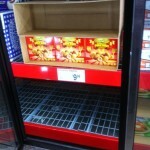 Of course, they are widely known for being served on Valentine’s Day. 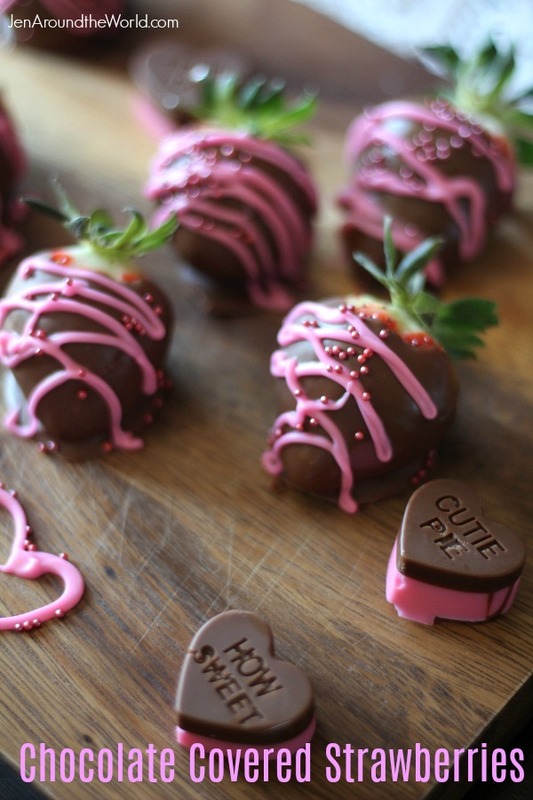 But you can totally make Chocolate Covered Strawberries for any occasion. We make them a lot during the summer months when the strawberries are at their ripest. 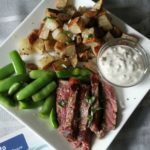 What is your all time favorite Valentine’s Day recipe? I love these so much! 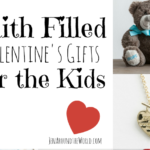 They’re perfect for a cute gift for the whole family or a romantic one for my hubs. Those look delicious! 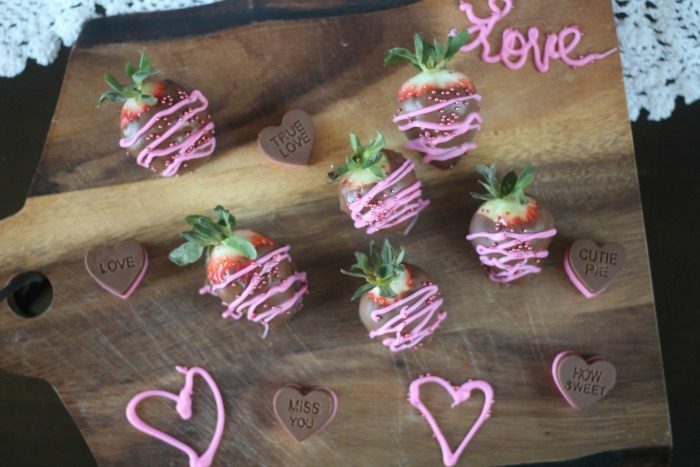 How creative are you all doing these chocolates covered strawberries! My husband would love these I may have to do them. Oh my goodness how absolutely delicious do these looks! I’ve never made my own chocolate covered strawberries but I have tried them elsewhere and they work so well together. I most definitely need to give them a try at home. There is nothing better than chocolate covered anything for Valentine’s Day. 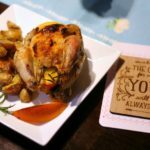 And this recipe looks easy enough. 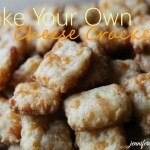 I’m going to try and make these. These look great and definitely not like a newbie made them. Chocolate covered strawberries is like my favorite thing on the planet. Very cute! I think that was one of the best Valentine’s Day surprises, when my husband and kids made me Chocolate covered strawberries. They look delicious! 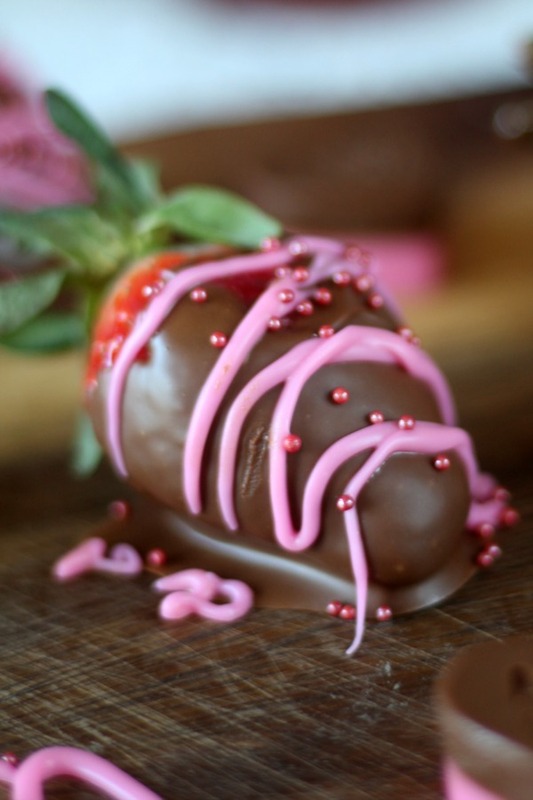 There is just something special about chocolate covered strawberries. Festive and yummy! They will be a special treat for sure. YUM! I used to work in a chocolate factory and would eat chocolate covered everything. Since I had kids, I’ve shown them how to make things and we wind up eating them all before the chocolate even hardens lol. How pretty these are! I love those candy hearts, too. The whole thing reminds me of a Cherry Mash – a candy made near my hometown. I think I might have to try this with cherries! How sweet these treats are. My kids would love these for sure. I should make some for them tomorrow. This is always a wonderful treat! I have never made my own before, but it sounds effortlessly easy. I’ll definitely have to try it! Oh yum! I love Chocolate Covered Strawberries. They are the perfect treat! Us too! I even made them to resemble basketballs for a wedding reception once. 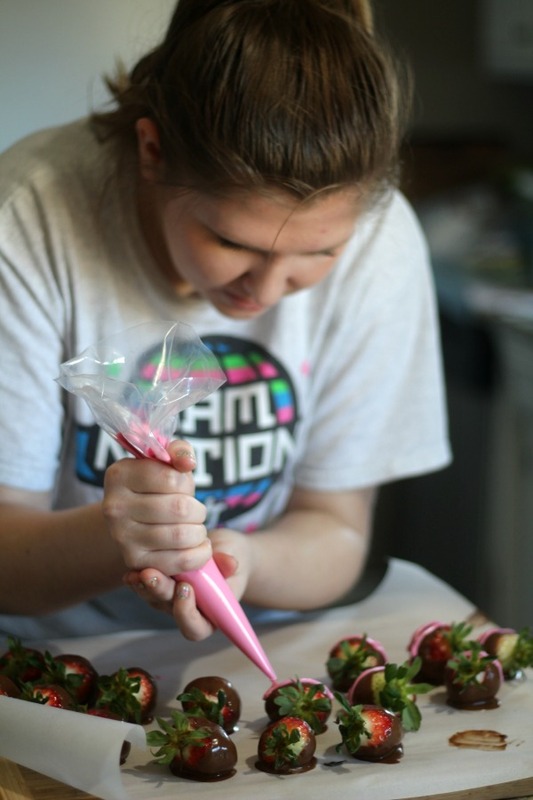 My nine year old daughter made her own chocolate covered strawberries for our neighbor’s Big Game party recently. She was so excited to see that her plate was the only one that didn’t have any leftovers. 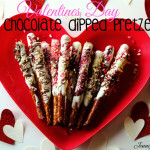 What a yummy treat for Valentine’s Day too! I’m psychologically allergic to strawberries so I wouldn’t eat these but these are too cute. You did an awesome job! I love the care that was taken into piping on the pink icing. I usually just splash around some white chocolate on top of mine. Well both the daughter and I were laughing at her lines. She was all over the place. I just happen to have a steady hand for that!